Gov. Chris Christie and then-Deputy Chief of Staff Bridget Anne Kelly in Seaside Heights on Sept. 12. The following story, originally published in January 2014, looks as the players as they were in the immediate aftermath of the scandal. At the time of the September 2013 George Washington Bridge toll closures, Christie, a 51-year-old Republican, was on his way to a landslide November re-election victory over Democratic state Sen. Barbara Buono. The eventual 22-point win in a largely Democratic state propelled Christie to the top of the list of potential Republican presidential candidates for 2016. He has framed that appeal as a result of his cooperation with members of the political opposition — and his image as a blunt-talking executive who is unafraid to make difficult decisions. The bridge scandal threatens to damage that reputation. A former corporate lawyer, Christie first got into politics as a fundraiser for President George H.W. Bush. He ran for state senate and lost, but was later elected to the Morris County Board of Chosen Freeholders. He ran for state Assembly and lost, then lost his bid for re-election to the county board. New Jersey Gov. Chris Christie apologized to the people of New Jersey and announced he has fired an aide who he says lied to him about being involved in the closure of lanes on the George Washington Bridge as political payback to a local mayor. Christie's political rise began after he returned to private practice and raised money for President George W. Bush, who nominated him to serve as New Jersey's U.S. attorney. He became a modern-day Eliot Ness, taking down dozens of corrupt politicians, including Gov. James McGreevey and Newark Mayor Sharpe James. Even then, he was accused of being a bully, and of awarding friends and allies with public contracts. In 2009, he upset billionaire incumbent Democratic Gov. Jon Corzine. As governor, Christie made a reputation of slashing spending, antagonizing labor unions and attacking critics in town hall meetings, which his staff recorded for his official YouTube page. Those performances burnished his national profile. In 2012, he gave the keynote speech at the Republican National Convention. Seeking to tamp down the bridge scandal, Christie held a press conference in which he was uncharacteristically contrite and apologetic, saying he'd known nothing in advance about the toll closures, and had been misled about the involvement of members of his staff. Later in the day, he visited Fort Lee to apologize personally. Kelly, 41, is the author of the most infamous email from the bridge scandal: "Time for some traffic problems in Fort Lee." She lives in suburban Bergen County, where Fort Lee is located. At the time of the scandal, she served as Christie's deputy chief of staff for legislative and intergovernmental affairs, earning $114,000 a year. The governor fired her amid the burgeoning scandal. Christie appointed Kelly to the post in April, promoting her from an administration position in which she served as his liaison to local elected officials. Before that, Kelly handled outreach between Christie's office and the state legislature. Her prior government jobs were assisting state lawmakers. Wildstein, the official at the Port Authority of New York and New Jersey who frequently corresponded with Kelly about the Fort Lee traffic problem, wrote in a text message that the students unable to get to school during the traffic jam "are the children of Buono voters," a reference to the Democratic lawmaker who ran against Christie last year. Wildstein attended Livingston High School with Christie in the late 1970s. He briefly served as Livingston's mayor a decade later, then went into private business. He was not well known in New Jersey politics until the bridge scandal unfolded; he joined the Port Authority soon after Christie's first election — hired by Bill Baroni, a top Christie adviser who served as the agency's deputy executive director. When the $215,000-a-year appointment was announced, Wildstein was outed as the long-anonymous man behind a popular political gossip site called PolitickerNJ. Wildstein's title was director of interstate capital projects, a position that drew little public scrutiny — until the scandal exposed him. Although he resigned in December from the Port Authority, Wildstein was called to testify to a state legislative committee, where he refused to answer questions. But in January his lawyer, Alan Zegas, asserted in a letter to the Port Authority that Christie knew about the closings as they happened. "Mr. Wildstein contests the accuracy of various statements that the governor made about him and he can prove the inaccuracy of some,” the letter said. Baroni, 42, one of Christie's most trusted confidantes, earned $289,667 a year as the Port Authority's deputy executive director until he stepped down amid the escalating bridge scandal. Christie had given Baroni the job soon after taking office in 2010. Baroni arrived at the agency after seven years in the state Legislature, where he represented parts of central New Jersey. He is a Republican, but had a reputation for bipartisan dealmaking, and was popular among members of both parties. He met Christie in the mid-1990s, when Christie was running for a spot on a county freeholder board. They became friends and by the time Christie was elected governor, Baroni was one of his highest-profile and most loyal aides. Stepien, Christie's campaign manager, participated in the email and text-message chains that exposed the toll closures as politically motivated. At one point, he emailed Wildstein to call the mayor of Fort Lee "an idiot." When he wasn't running Christie's campaigns, Stepien served as a deputy chief of staff in Trenton, and is credited for the idea of Christie's highly popular series of town-hall meetings. Before joining Christie, Stepien worked on the presidential campaigns of Sen. John McCain and former Mayor Giuliani. He also managed several local New Jersey races, including Baroni's successful campaign for state Senate. Until this week, Stepien was in line to head the state Republican Party. That opportunity vanished this week, after the emails became public, and Christie asked Stepien to withdraw himself from consideration. He also said he asked Stepien to withdraw from his position as a consultant to the Republican Governors Association, which Christie chairs. Samson, 74, Christie's handpicked chairman of the Port Authority, is a former New Jersey attorney general, having served in the administration of Democratic Gov. James McGreevey. He was Christie's 2009 campaign lawyer, and headed the governor-elect's transition committee. Samson was pulled into the bridge scandal by an Wildstein email to Kelly that was made public this week. In the email, Wildstein mentioned the lifting of the toll closures after five days by a New York appointee to the Port Authority. "The New York side gave Fort Lee back all three lanes this morning," Wildstein wrote Kelly on Sept. 13. "We are appropriately going nuts. Samson helping us to retaliate." In response, Samson said he was "extremely upset and distressed" over the emails. He denied having any knowledge of the closures until they were lifted. But he has hired former Homeland Security chief Michael Chertoff to represent him. Samson's name surfaced in the news again in late January, when a New Jersey paper reported that as Port Authority chairman he backed a plan to renovate a train station located close to a planned housing complex proposed by a builder represented by his law firm. Mastro is a high profile defense attorney and longtime associate of former Mayor Giuliani who was tapped by Christie in January to conduct an internal review of his administration's handling of the bridge closures. Mastro will also help Christie respond to an investigation by the U.S. attorney in Newark. It is unclear if Mastro will be involved in the state legislative probes. Mastro works at the firm Gibson, Dunn & Crutcher, which has represented Christie in personal matters for years. Mastro previously served as an assistant U.S. attorney under Giuliani before he became mayor, and then served as one of Giuliani's deputy mayors. Recently, Mastro has represented Chevron in the oil company's fight against a multi-billion-dollar pollution judgment in Ecuador. Sokolich, 49, is the Democratic mayor of Fort Lee, the town on the New Jersey side of the George Washington Bridge. As traffic stalled for hours at the bridge when the lanes were closed, it also clogged the streets of his tiny municipality. On Sept. 10, Sokolich, a lawyer, pleaded for help from Baroni in a text message. A couple days later, Sokolich asserted that the lane closures were "punitive." That claim marked the beginnings of a scandal that would grow over the next several weeks. After the emails became public, Sokolich told MSNBC that Wildstein "deserves an a-- kicking." On Jan. 9, Christie apologized to Sokolich and Fort Lee and said he would visit the town that day to deliver the message personally. Sokolich said he appreciated it, but the visit would be premature because there are so many outstanding questions. Christie went anyway. Fulop, 36, is the mayor of Jersey City, N.J., a position he arrived at by an unusual route. A former Wall Street trader who took a break to join the Marines and fight in Iraq, Fulop was taken under the wing of former Jersey City Mayor Glenn Cunningham, who encouraged him to run for office. Fulop's first campaign in 2004, a Democratic primary challenge to incumbent U.S. Rep. Robert Menendez, failed by a huge margin. A year later, Fulop won election to the city council despite having no support from the political establishment (Cunningham had since died while in office). He burnished his anti-establishment credentials and won a second term before unseating incumbent Mayor Jerramiah Healy last year. Christie, running for re-election, called to congratulate Fulop, and spoke at his inauguration. But after the Fort Lee traffic scandal exploded, Fulop came forward to say that Christie aides had inexplicably canceled meetings with him the prior summer, which the Democratic mayor said was in retaliation for choosing not to endorse the governor. A Christie representative denied Fulop's accusation. Fulop is considered a rising star in New Jersey Democratic politics, and a possible candidate for governor one day. Zimmer, 45, is the mayor of Hoboken, N.J. A former communications executive and open-space activist, she served as a city councilwoman for two years before losing a bid for mayor in 2009. The man she lost to, Peter Cammarano, was arrested on bribery charges weeks after his swearing in, and Zimmer took over as acting mayor. She won a special election later that year, and won re-election in 2013. A Democrat and vocal supporter of Christie, Zimmer was an example of the crossover appeal that has burnished the governor's national image. But she declined to take sides in Christie's 2013 re-election bid. On Jan. 18, she became the third Democratic mayor to come forward with allegations that Christie had played politics with state resources. 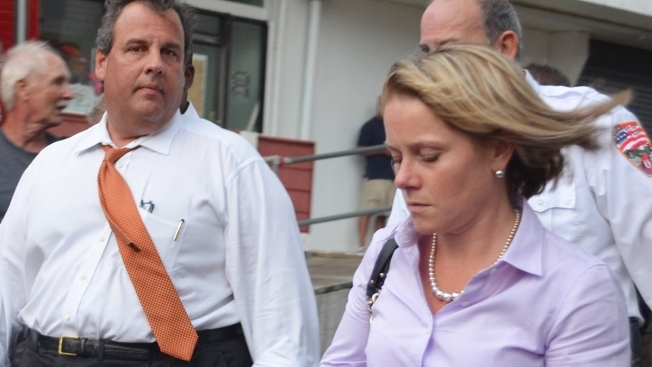 Zimmer alleged that senior members of Christie's administration, including Lt. Gov. Kim Guadagno, warned her last year that if she didn't approve a development project he supported, then the state would withhold grants that would help her city rebound form Hurricane Sandy. Guadagno and a Christie spokesman denied the charge. Wisniewski, 51, heads the New Jersey State Assembly's Transportation Committee and has led the panel's expanding investigation of the lane closures — along with other allegations of political payback involving the Port Authority. The panel's work resulted in the release of the damning emails and text messages that prompted Christie to fire a top aide and cut ties to other key advisers. A career politician who has represented Middlesex County for nearly two decades, Wisniewski, a Democrat, has suggested that if his probe unearths evidence of criminal conduct, then an impeachment of Christie could be pursued. He is expected to become co-chair, with state Sen. Loretta Weinberg, of a Democrat-dominated "super committee" that will handle the rest of the legislative investigation. Weinberg, 78, is the New Jersey State Senate's majority leader and represents a district that includes Fort Lee. She heads the newly formed Senate Select Committee on Investigation, which has joined the bridge probe by issuing subpoenas for testimony from many Christie aides. Weinberg is expected to serve as co-chair, with Assemblyman John Wisniewski, of a "super committee" that will conduct the legislative investigation into the closures. Weinberg, a Democrat, has served in the Senate since 2005; for a decade prior, she served in the Assembly. She ran for lieutenant governor on Gov. Jon Corzine's 2009 ticket, which lost to Christie and Guadagno.